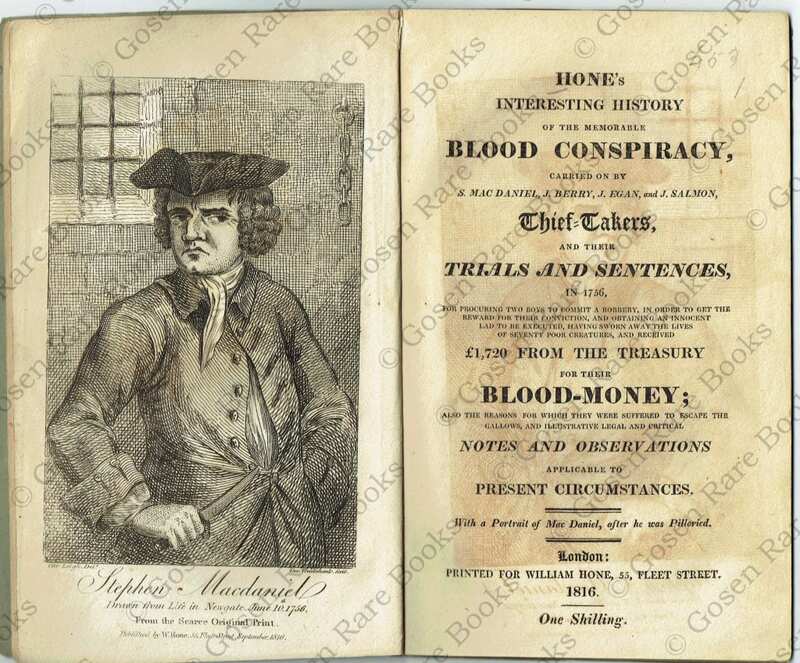 William Hone’s Interesting History of the Memorable Blood Conspiracy, Carried on by S. MacDaniel, J. Berry, J. Egan, and J. Salmon, Thief-Takers, and Their Trials and Sentences, in 1756. Cohn 399. Portrait of MacDaniel by Cruikshank. [Cruikshank, George] Hone’s Interesting History of the Memorable Blood Conspiracy, Carried on by S. MacDaniel, J. Berry, J. Egan, and J. Salmon, Thief-Takers, and Their Trials and Sentences, in 1756. For Procuring Two Boys to Commit a Robbery, in Order to Get the Reward for Their Conviction, and Detaining an Innocent Lad to Be Executed, Having Sworn Away the Lives of Seventy Poor Creatures, and Received £1,750 from the Treasury for Their Blood-Money; also the Reasons for Which They Were Suffered to Escape the Gallows, and Illustrative Legal and Critical Notes and Observations Applicable to Present Circumstances. With a Portrait of MacDaniel, after He Was Pilloried. London: Printed for William Hone, 55, Fleet Street, 1816. 20.5 cm Copperplate frontispiece of MacDaniel, “Geo. Cruikshank, fecit.” 32 pages. J. Adlard, 32 Bartholomew-Close named on last page. Stitched and wrapped in green publisher’s wrapper. Cohn 399. Very good.